Our Basic Course is 6 2hour classes. Most people take one class in a week and finish the basic course in 6 weeks. Some come intensively like taking few classes in a week so they can complete the course in a couple of weeks. Every courses of my studio doesn’t have a starting date. People can sign up and start their class any time all year around. I usually suggest people to come once in a week at least specially at the beginning of learning. Otherwise they won’t remember what they learned at the last class. People make a scarf size piece (8 inches wide & 6 feet long) in the basic course unless they have a specific work in their mind. I teach from scratch even for 6-years-old or 78-years-old. The students learn how to wind and set up their own warp thread, how to weave, techniques and tricks, and how to tie the fringes to finish the piece. Some weave so quickly. Some take a long time to choose color they use. Some weave very carefully. Some just go to town from the start. In this summer I had 2 young men who took the basic course. This time was a second time for both of them to take the 6 class course. So they had a project in their mind, a bag. It’s amazing to me how well the young brain works. Also, I was impressed by their powerful concentration as well. They were not taking the classes together although they were in a same class once in Saturday morning. 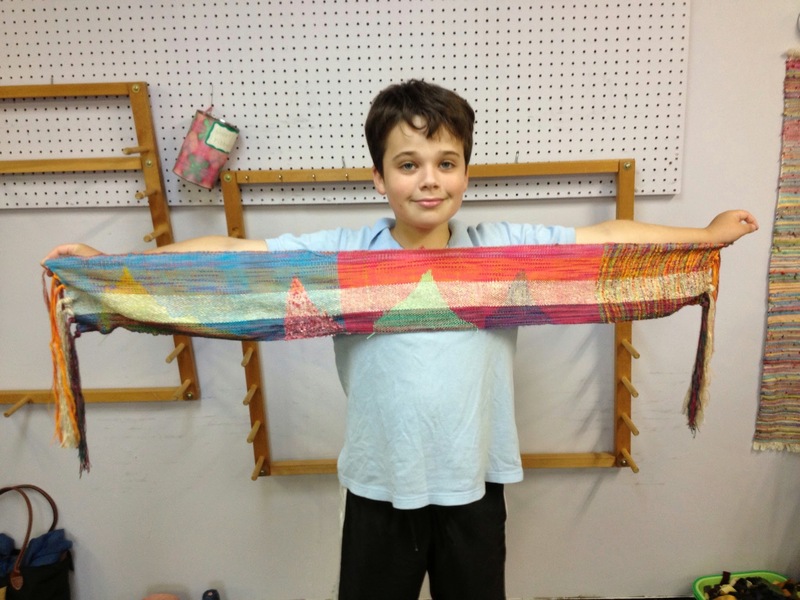 Jacob with the fabric which is for his younger sister. Class 1: They wound warp and started sleying into a reed. Class 2: They finished sleying and threading to the harness. They completed setting up the warp on a loom. Class 4: They finished weaving. They brought the fabric home and washed. Class 5: They brought the fabric back to the studio. They learned how to use a sewing machine. 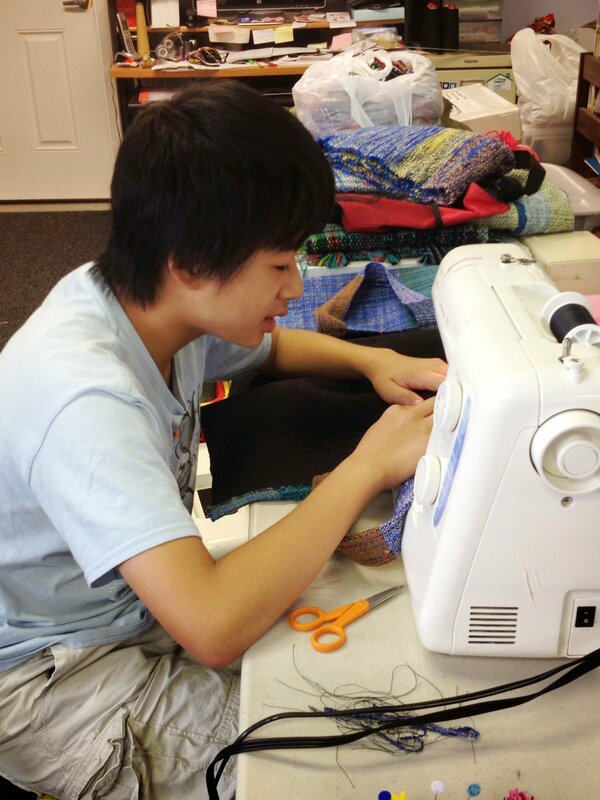 They sewed and cut the fabric, applied interfacing, and started putting things together. Arthur is sewing on a machine. 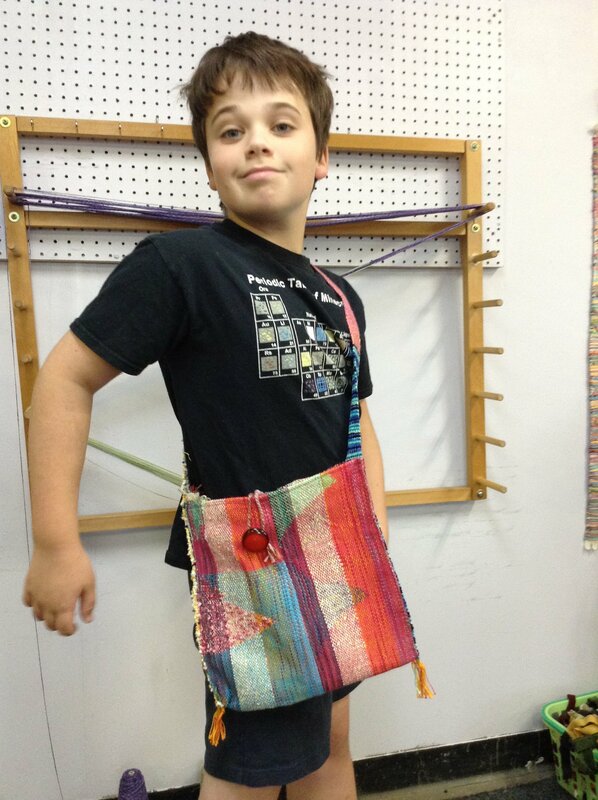 Class 6: They made handles/a strap and putting all together to complete a bag. 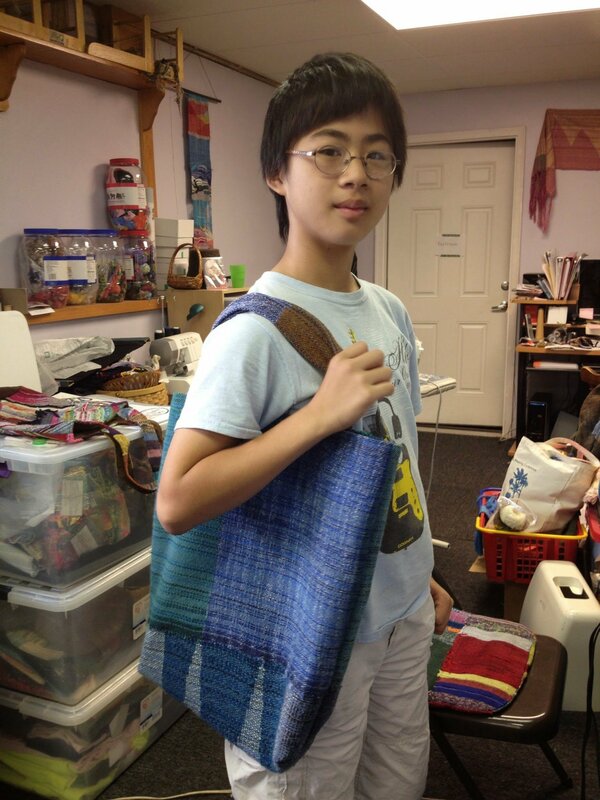 Arthur finished his bag for music class. Jacob is pausing for the picture shot with his creation. I have been developing patterns that people can sew easily over years. I learned so much from teaching. Both Arthur and Jacob enjoyed learning how to use a sewing machine. They were so careful to make one step a time. I am so proud of them. Looking at their satisfied faces, I thought I should make a textile camp for kids (and adults ) in near future. This kind of experience gives any one so much pleasure and understanding how things are made. And they can enjoy the finished work in daily life.